Six new string art patterns have been added to the String Art Fun website. The religious patterns are a plain cross, a decorative cross, a cross on a hill, a dove, a girl praying and an angel. The pattern size is approximately 300 mm x 210 mm (12 x 8½ inches). They are delivered by download to your computer in PDF format. The patterns are available individually and in a value pack of six patterns for the price of five individual patterns. 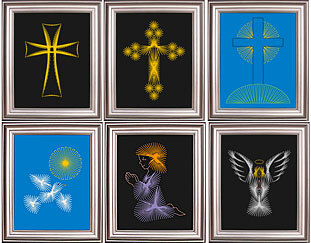 The patterns are in the Religious section of the String Art Fun website. This entry was posted in String Art and tagged religious, String art on Tuesday 14 June 2011 by David Jefferson. This entry was posted in String Art and tagged String art on Wednesday 17 December 2008 by David Jefferson. You could also look in the knitting wool section. If you can find silver wool it would be good choice for string art. Silver shows up particularly well against a black background. I was in my local craft store recently and as it is getting close to Christmas they have all sorts of coloured strings for making decorations. It is worth buying a few different types just to experiment with. What is your favourite stringing material? Please let us know in a comment to this post. This entry was posted in String Art and tagged String art on Monday 15 December 2008 by David Jefferson. Since we are using nails to create our string art picture you may wonder why I am asking about drilling. The answer will depend on the material you are using for your baseboard. It may also depend on the size of nails you are using. If you are using a base that is easily penetrated by nails such as cork of soft fibre board then the nails will go in easily with just a hammer. If you are using a harder base such as plywood or MDF (medium density fibreboard) then pre-drilling the holes can make the nailing easier and more accurate. Chose a drill bit that is smaller than the nails you are going to use. You do not want the nails to fall through the holes. They should be a tight fit when nailed in. I use a small battery powered drill. It has a built in spirit level on the top and back so it is easy to judge when it is vertical. Fix your paper template onto your baseboard with tape or similar. Drill through the dots and then remove the template. You can now hammer your nails into the drilled holes. This entry was posted in String Art and tagged String art on Tuesday 9 December 2008 by David Jefferson. This is my review of what I consider to be the best web sites for string art enthusiasts. I have rated them on the usefulness of the information given and the patterns that they offer. Click on the site names to visit the web sites. This is a great place for string art enthusiasts to start. There is an illustrated step-by-step guide to making string art pictures. Teachers will find some articles on how to introduce string art to children. There are six free patterns to download and a number of attractive patterns available for purchase. There is a section with Christmas designs using colourful drawing pins (thumb tacks) together with sparkly decorative cords and ribbons to give a festive look to the pictures. This web site has an animated demonstration of string art aimed at children, using a square design. There are five free patterns to download based on simple geometric shapes. There are several comprehensive articles on string art covering design, techniques and procedures. There are also some free projects with patterns and instructions. This website appears to have closed. The art gallery features a number of pictures made by grade 6 students. There are no instructions or patterns but the pictures show what is possible with string art. This is a detailed project on how to make a string art flower. There is a free pattern to download and a list of materials used. Ths web site has a “Kids Corner” with a string art sailboat project. It includes a materials list, a pattern to print and the instructions. This has a page called “String Art – An Adventure in Line Designs”. It discusses the use of string art as a basis for mathematical understanding of geometric shapes and relationships of points, segments, and angles. There is a project ready to present to students. This gallery has a string art page featuring eleven geometric pictures. A good source of inspiration. This web site features lots of photographs of 3D string art projects produced by the artist Rynders Wilfried. This web site has a page called “Curve-stitch Designs”. It includes a complex isometric cube drawing that could form the basis of a string art pattern. This entry was posted in String Art and tagged String art on Saturday 6 December 2008 by David Jefferson. String art makes a bold picture that you can hang on your wall. Prick and stitch is a miniature form of string art used to make greetings cards.Â Prick and stitch cardsÂ are considered byÂ many peopleÂ to have developed from the string art techniques. String art and prick and stitch cards (also called stitching cards) have a lot in common and some differences. Instead of nails you have holes pricked in the card. Instead of the string turning round the nails you have thread emerging from a pricked hole, going across the pattern and entering a second hole. The design builds up in a similar way with crossing strings (or threads) filling a shape with colour. The illustation is the free flowering vine pattern from the Stitching Cards web site. If you fancy trying your hand at prick and stitch card making go to Stitching Cards free patterns. This entry was posted in String Art and tagged greetings cards, prick and stitch, String art on Thursday 14 August 2008 by David Jefferson.